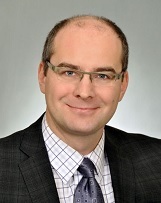 According to the leaked information from the City hall, the Freedom of Information Requests (FOI 2018 – 62 and FOI 2018 – 63) to access Kevin Fowke’s, (General Manger Corporate Services) current employment contract and the legal fees paid by his division for external legal firms to undertake labour and employment matters (2013 – 2018) were denied. On behalf of the corrupt administrators, Adam Kosnick, Manager of Regulated Services / Deputy City Clerk issued the decision. Fowke received generous package from Bigger and his salary increased by 26% in 2017 and now reached to total package of $202,951.80. Under Fowke’s watch, City corrupt administrators paid over $ 700,000.00 (January 2007 to August 2012) to a Toronto based legal firm. City also paid over $7.5 million dollars (2008 – 2010) to one of the local legal firms who has close ties with the bureaucrats for labour and employment matters. Every year it costs the City over 1.9 million tax dollars to operate its own legal services division with 7 or more lawyers and support staff. According to sources available to WikiLeaks Sudbury, the matter has been appealed to the Information and Privacy Commissioner of Ontario. WikiLeaks Sudbury will release more information to public soon after they become available. Stay tuned. 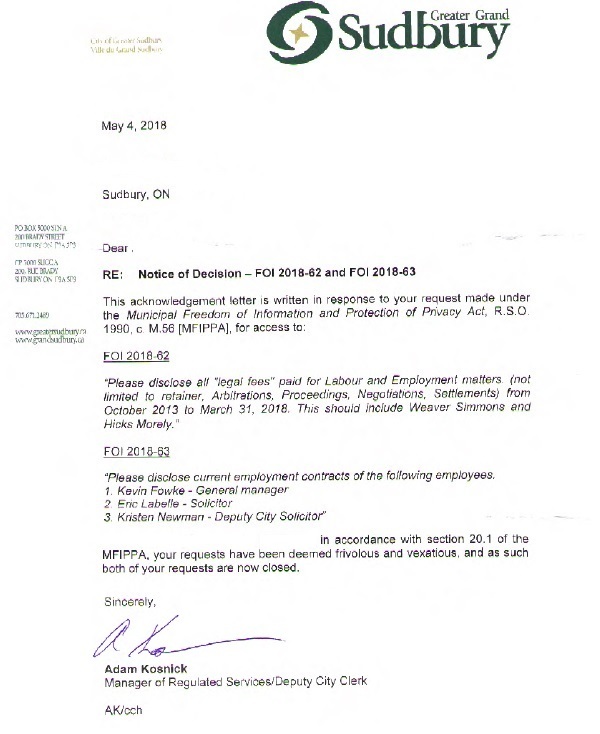 The leaked documents from the human resources division revealed that Fowke paid over $100,000.00 as legal fees to one of the labour and employment matters. 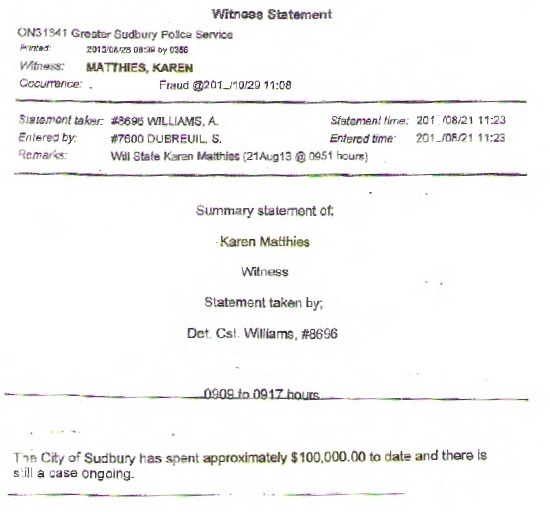 Karen Matthies, a former Human Resources coordinator, provided this information to the Greater Sudbury Police services. According to the report, resolution to the dispute cost only $20.00. The taxpayers were scammed by Fowke and legal services division to spend over $100,000 and back pocketed thousand of tax dollars. They took this case as golden opportunity to scam public funds. Generous retainer was signed with Toronto based legal firm. WikiLeaks Sudbury will not disclose name of the legal firm in order to protect their economic interest. This is another example how Fowke led corrupt official at City hall to manage the administration of the City hall. They are corrupt and attempt to hide their incompetence at the cost of taxpayers. The distinction between corruption levels is made in order to uncover the shifting roles and the administrators might play in grand and petty corruption. In grand corruption the interaction and power balance between Bigger and administrators are very important. In a Sudbury case both groups are involved and the incentives for corruption must be coincided between them. Separating Bigger and Fowke’s administrators, or isolating them from each other might be ways to obstruct the coordination of corrupt networks. Therefore Fowke and the corrupt administrators must be kicked out from the City hall. No other options available to protect the taxpayers. Bigger administration is planned another round of tax increase by 3.6% and water and wastewater rates expected to go up by 7.4%. Bigger was failed to stabilize expenses in the City hall. During the budget process, there was a no real debate and no real alternatives offered. 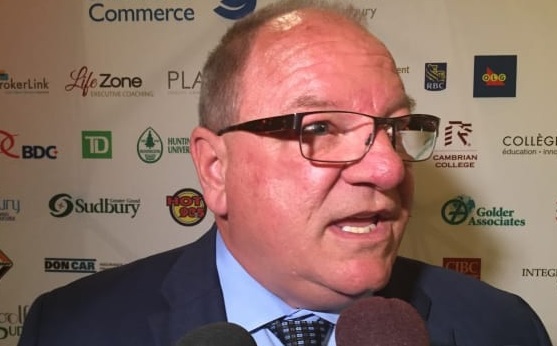 Sudbury’ s economic growth is recorded low. Ordinary taxpayers and senior citizens cannot afford tax hike and Sudbury tax increases are unsustainable. The only beneficiaries from this are Bigger and corrupt administrators. However, City hall administrators are ready to spend thousands of tax dollars to cover up their incompetence at the cost of taxpayers.